The dominant technology of modern proteomics is certainly liquid chromatography-mass spectrometry (LC-MS). However, it is safe to say that the primary discussion point in terms of technology in proteomics has been the mass spectrometry part of this partnership. A great deal of emphasis is placed on the mass spectrometer and the data generated by it. However, there has been less focus and emphasis placed on the separations of peptides and proteins prior to analysis by mass spectrometry in terms of the nano-LC chromatography systems and columns contributing to proteomics performance. One half of the LC-MS combination has been neglected. Therefore it seemed to the authors that it was time this imbalance was redressed. The following handbook has been produced in an attempt to educate and inform on the relevance and significance to proteomics of liquid chromatography, in particular reversed-phase nano-LC directly coupled to MS. 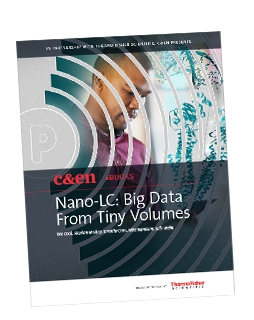 Learn how reversed-phase nano-LC directly coupled to a mass spectrometer is revolutionizing the field of proteomics. Understand how decreased column diameter and gradient separation in nano-LC MS can increase sensitivity and increase signal strength. Learn how nano-LC MS can be used for large targeted screening and validation studies.